The rocking colt is an ideal gift for a child just beginning to walk. Young children are drawn to the life and beauty in the horse's face and eyes, and because he is right on their level they can hop on the horse for a safe ride -- just hold on to the ears and start rocking. 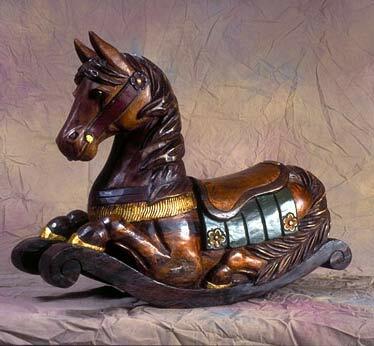 The nostalgic rocking colt becomes a treasured gift for life and many consider them a family heirloom. Every detail of the colt is hand carved -- every hair, the mane and tail, the hooves and shoes, the saddle, is carved with intricate detail. 24 karat gold leaf is on the horse shoes, the bit and the saddle.